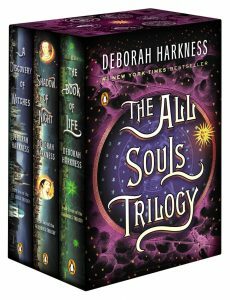 Most of you know that the All Souls Trilogy by Deborah Harkness is one of my very top series of all time. 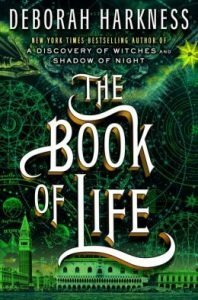 I love that the story is imbued with a one-of-a-kind mix of magic and science, history and fiction, suspense and mystery. Impeccably penned by Harkness, these three novels represent everything I endeavor to find in a book. 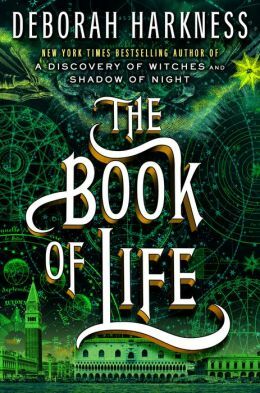 To celebrate the May 26th paperback release of the final book in the series, The Book of Life, I’ve got an amazing giveaway, a Q&A with the author and lots of content to read through below. It has been amazing—and a bit overwhelming. I was surprised by how quickly readers embraced two central characters who have a considerable number of quirks and challenge our typical notion of what a heroine or hero should be. And I continue to be amazed whenever a new reader pops up, whether one in the US or somewhere like Finland or Japan—to tell me how much they enjoyed being caught up in the world of the Bishops and de Clemonts. Sometimes when I meet readers they ask me how their friends are doing—meaning Diana, or Matthew, or Miriam. That’s an extraordinary experience for a writer. Ghosts didn’t have much substance. All they were composed of was memories and heart. Atop one of Sept-Tours’ round towers, Emily Mather pressed a diaphanous hand against the spot in the center of her chest that even now was heavy with dread. Not that I’ve noticed, Philippe de Clermont replied shortly. He was perched nearby, studying his own transparent fingers. Of all the things Philippe disliked about being dead—the inability to touch his wife, Ysabeau; his lack of smell or taste; the fact that he had no muscles for a good sparring match—invisibility topped the list. It was a constant reminder of how inconsequential he had become. Emily’s face fell, and Philippe silently cursed himself. Since she’d died, the witch had been his constant companion, cutting his loneliness in two. What was he thinking, barking at her as if she were a servant? Perhaps it will be easier when they don’t need us anymore, Philippe said in a gentler tone. He might be the more experienced ghost, but it was Emily who understood the metaphysics of their situation. What the witch had told him went against everything Philippe believed about the afterworld. He thought the living saw the dead because they needed something from them: assistance, forgiveness, retribution. Emily insisted these were nothing more than human myths, and it was only when the living moved on and let go that the dead could appear to them. This information made Ysabeau’s failure to notice him somewhat easier to bear, but not much. “I can’t wait to see Em’s reaction. She’s going to be so surprised.” Diana’s warm alto floated up to the battlements. Diana and Matthew, Emily and Philippe said in unison, peering down to the cobbled courtyard that surrounded the château. There, Philippe said, pointing at the drive. Even dead, he had vampire sight that was sharper than any human’s. He was also still handsomer than any man had a right to be, with his broad shoulders and devilish grin. He turned the latter on Emily, who couldn’t help grinning back. They are a fine couple, are they not? Look how much my son has changed. Vampires weren’t supposed to be altered by the passing of time, and therefore Emily expected to see the same black hair, so dark it glinted blue; the same mutable gray-green eyes, cool and remote as a winter sea; the same pale skin and wide mouth. There were a few subtle differences, though, as Philippe suggested. Matthew’s hair was shorter, and he had a beard that made him look even more dangerous, like a pirate. She gasped. Is Matthew . . . bigger? He is. I fattened him up when he and Diana were here in 1590. Books were making him soft. Matthew needed to fight more and read less. Philippe had always contended there was such a thing as too much education. Matthew was living proof of it. Diana looks different, too. More like her mother, with that long, coppery hair, Em said, acknowledging the most obvious change in her niece. Diana stumbled on a cobblestone, and Matthew’s hand shot out to steady her. Once, Emily had seen Matthew’s incessant hovering as a sign of vampire overprotectiveness. Now, with the perspicacity of a ghost, she realized that this tendency stemmed from his preternatural awareness of every change in Diana’s expression, every shift of mood, every sign of fatigue or hunger. Today, however, Matthew’s concern seemed even more focused and acute. Emily examined her niece more carefully, using the enhanced grasp of truth that death afforded. Philippe was right—in part. You mean “with children.” Diana is having twins. Twins, Philippe said in an awed voice. He looked away, distracted by the appearance of his wife. Look, here are Ysabeau and Sarah with Sophie and Margaret. What will happen now, Philippe? Emily asked, her heart growing heavier with anticipation. Diana has never liked change, Emily said. That is because Diana is afraid of what she must become, Philippe replied. Marcus Whitmore had faced horrors aplenty since the night in 1781 when Matthew de Clermont made him a vampire. None had prepared him for today’s ordeal: telling Diana Bishop that her beloved aunt, Emily Mather, was dead. Marcus had received the phone call from Ysabeau while he and Nathaniel Wilson were watching the television news in the family library. Sophie, Na- thaniel’s wife, and their baby, Margaret, were dozing on a nearby sofa. Marcus had obeyed his grandmother without question, only taking time to shout for his cousin, Gallowglass, and his Aunt Verin on his way out the door. The summer half-light of evening had lightened further as he approached the clearing at the top of the mountain, brightened by the otherworldly power that Marcus glimpsed through the trees. His hair stood at attention at the magic in the air. Then he scented the presence of a vampire, Gerbert of Aurillac. And someone else—a witch. A light, purposeful step sounded down the stone corridor, drawing Marcus out of the past and back into the present. The heavy door opened, creaking as it always did. On May 26th, all three All Souls Trilogy novels are also available in an elegantly designed paperback boxed set that’s perfect for loyal readers (like me! ).